The rains of April have left the ground damp and fresh with the reborn green as we march our way into the summer. We will be felled by the coming heat and humidity but for now, we enjoy the moment of peace. We sympathize with Officer Lem, though. She’s just doing her job, even though she does often go above and beyond the call, even when no one made the call in the first place. It’s Nemi’s work that brings this week’s Tuesday uEtsy to Beat Black, and their selection of zombie-related accessories. 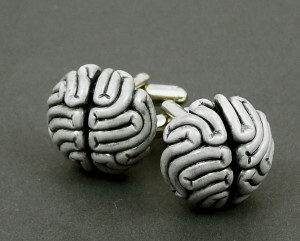 If you attend the Department formal fundraiser at the end of the month, it would be wise to don these pair of cufflinks. It matters not the color of jacket you wear, for Beat Black carries them in three flavors: grey matter, lunch meat pink and moldy green. Fashionable. Subtle. Classy. Perhaps you want something more informal? 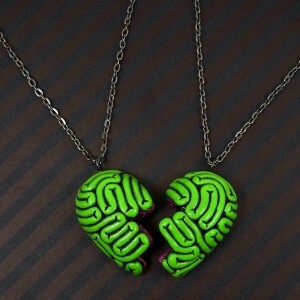 This Best Friends necklace takes the concept of “giving you a piece of my mind” to the literal sense. 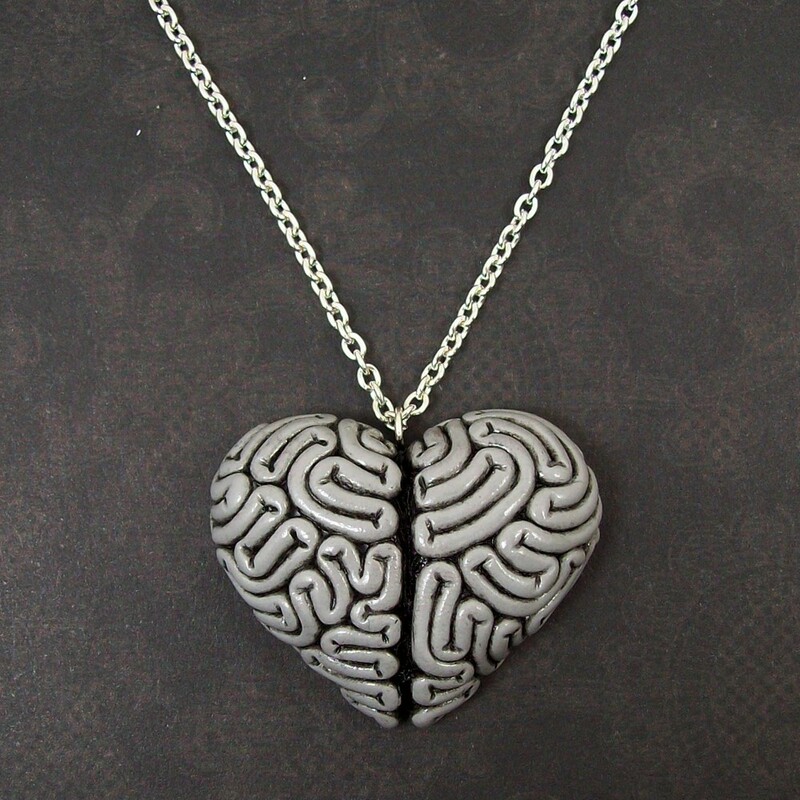 Offer a bit of grey matter to someone who matters to you, forever saying that your thoughts (in some sense) are always with that person. One of Lem’s ongoing efforts is to dispel the stereotype that any resurrected person only consumes the organ between your ears. No, the general consensus is that your average reanimated body will maintain an appetite. Those who do are often considered hazardous and won’t start at your brain. 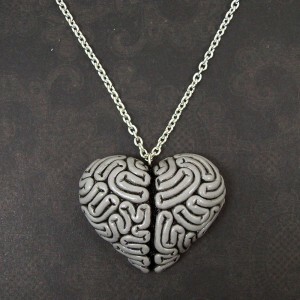 Perhaps this black heart will remind you of that bit of tastiness that’s easier to get to than what it will take to crack your skull. Or what will be beating out of your chest as you run. While she was visiting a few months ago, the Intern noticed something around Nemi’s wrist. “Oh,” she said and explained that it was a bracelet she got the day her mother’s clean bill of health came back. As a daughter of a cancer survivor, Nemi participates in many events: walks for cure; sitting on an advisory board. It also motivates her to keep track of those who pass due to cancer and similar diseases. Someone who died of cancer comes back with greater complications. It’s sad, and Nemi is tireless in her work. While these Black Lungs shouldn’t bring about the connotation of such sadness, perhaps they can remind you to celebrate your ability to breathe or what others go through for that luxury. 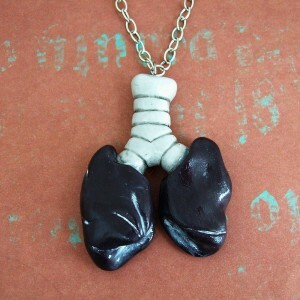 It’s not all organs over at Black Beat. 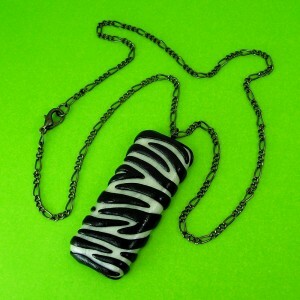 They have a wide variety of broaches, earrings, cufflinks and necklaces. 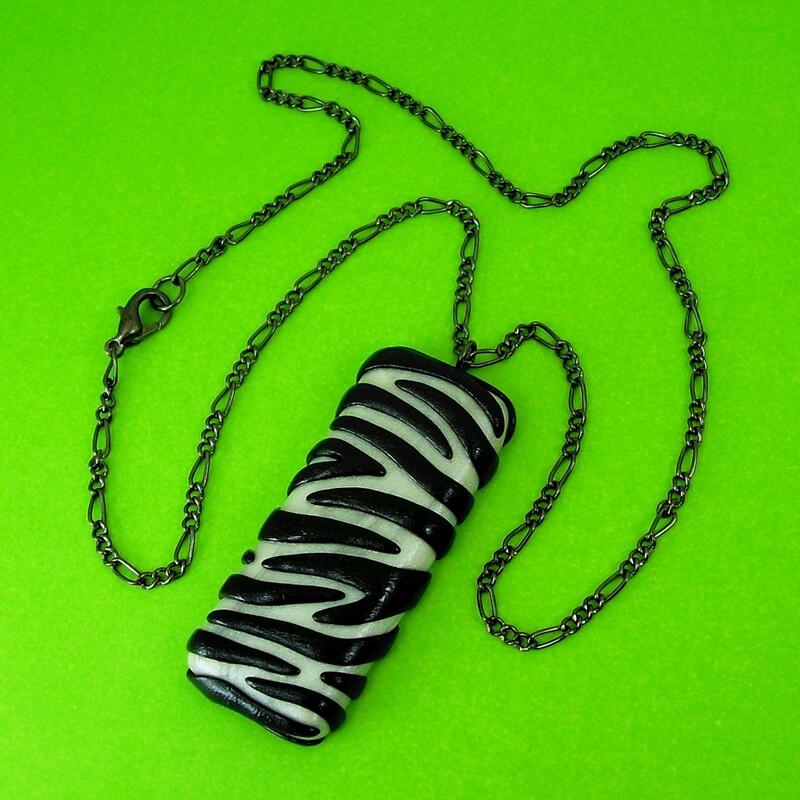 This Zebra squared necklace is a wonderful piece that can be worn all year ‘round. 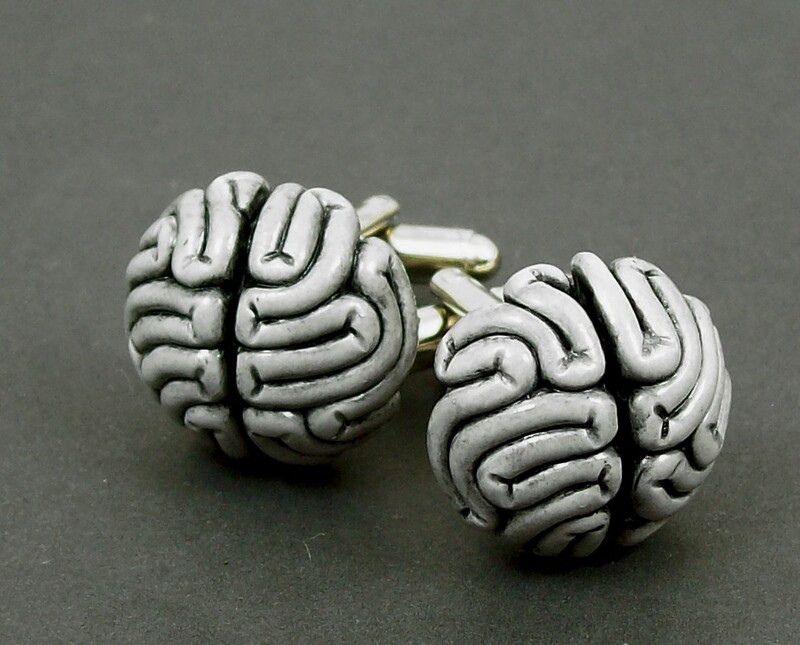 It’s something that Lem could wear, complementing her daily uniform. Plus, no animals were harmed in making it, which is something we know she would enjoy. It’s rough trying to save the world; doubly so when you’re still on duty after it dies and comes back. You don’t need to die to wear these fashions. 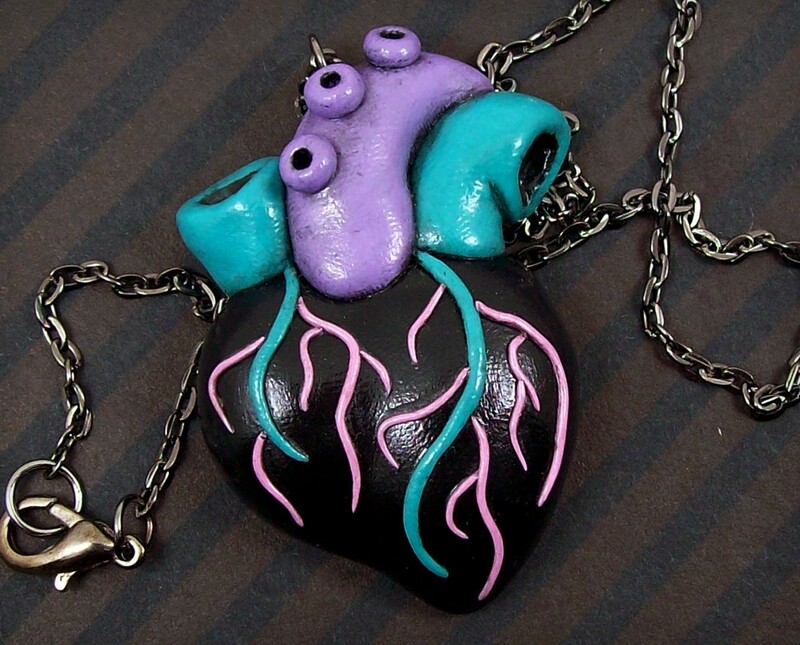 You just need to go over to Beat Black’s Etsy Store. You can also find them on Facebook and Twitter. Be sure to check out the official Deviant Art account as well as the Flickr stream. 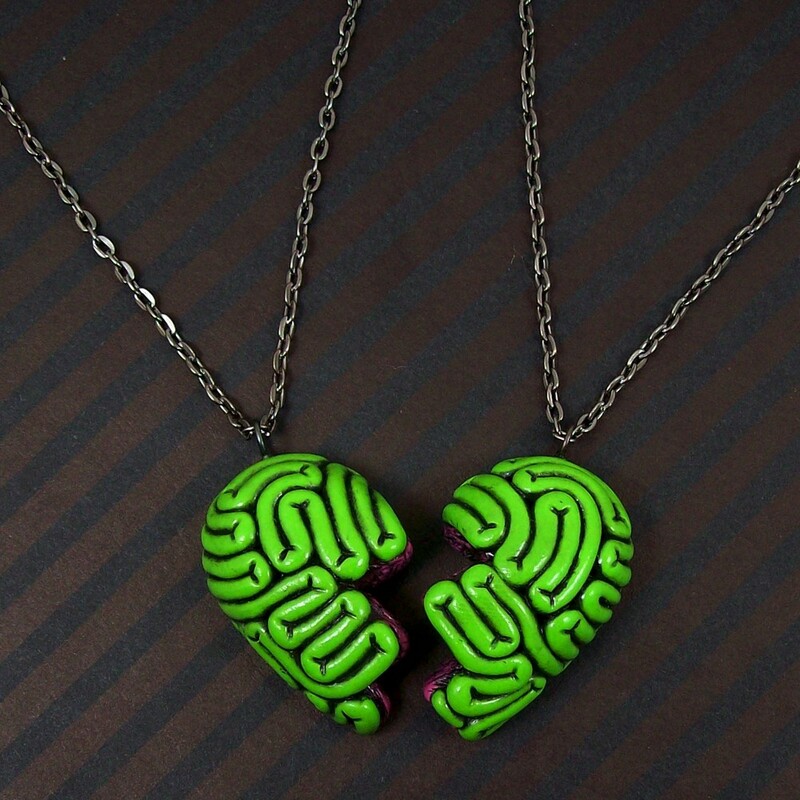 When you’re done making the scene with your new zombie inspired bling, come back next week for another Tuesday uEtsy.